The all new Z650 builds on the success story of the now old ER-6n. The all-new bike uses a similar parallel 649cc 8v twin, which now meets Euro4 guidelines. However, that is where the similarities end. The 10kg lighter trellis frame is all new, as is the swing-arm which has a further weight saving of 2.7kg: overall the Zed is 17kg lighter. The reduction in weight and improved low to mid-range power makes the Z650 more enjoyable and easier to ride than its predecessor. A lower, thinner seat, lighter clutch with slipper action and dramatic styling make it more appealing than ever. The old side-mounted rear shock has been discarded in favour of a conventional central mounted horizontal shock with linkage. This reduces the load on the spring and improves the ride quality at both high and low speeds. The rear shock has preload adjustment, but you have to remove the shock to adjust. The front 41mm forks are non-adjustable, but are more than adequate out of the box. The Z650 is light, flickable and fun once you’ve managed to build some heat in the aging Dunlop Sportmax tyres which come as standard. The 649cc DOHC engine is based on the old ER-6n but now meets tight Euro4 regulations. Kawasaki have actually lost a few peak BHP compared to the old model - 67.3bhp compared to the 71bhp of the previous model. However, the new engine has a greater spread of torque in the low to mid-range. Peak torque is now 48.5ftlb at 6500rpm. 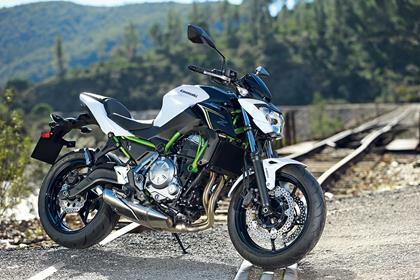 The new trellis frame is made using similar technology to that of Kawasaki’s flagship H2. The finish is really impressive considering the price. The new clocks are neater as is the overall styling. There are also a whole host of accessories if you wish to personalise your Zed from an Akrapovic exhaust to soft panniers for touring. Vibrations from the parallel twin are only just noticeable at high speeds unlike the vibey original ER-6n in 2005. At £6099 the Zed is excellent value for money priced similarly to Suzuki’s new in 2016 SV650 and Yamaha’s award winning MT-07. As expected and in accordance with Euro4 regulations ABS comes as standard. Kawasaki has also fitted an assisted and slipper clutch for the first time. The new digital clocks are an added bonus. 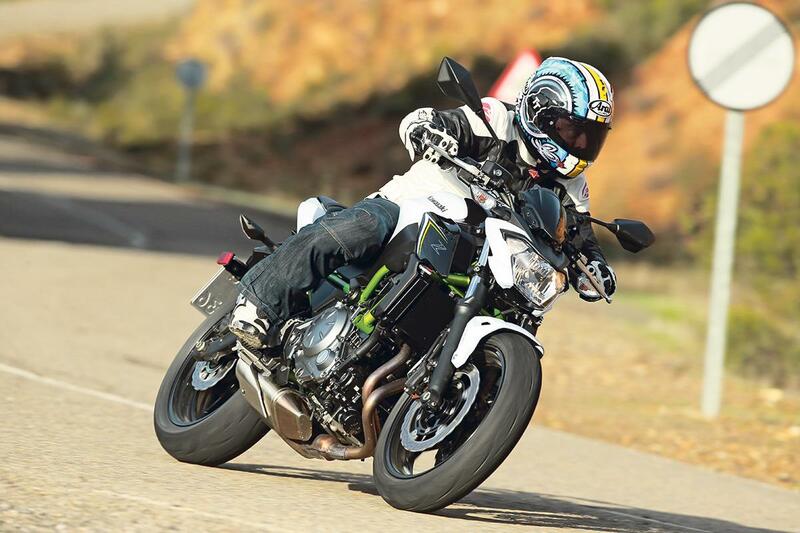 2 owners have reviewed their KAWASAKI Z650 (2017-on) and rated it in a number of areas. Read what they have to say and what they like and dislike about the bike below. Swapped a GSXR for the new Z650. I have little legs so the low seat is confidence inspiring. It's comfy and I like the streetfighter styling. The handling is good. I'm still running it in, so I'm missing the power of my previous bike. I bought it for commuting and trips to a caravan 70 miles away. You either get power or economy, and it has good mpg. I like the comprehensive digital dash, small but easy read and has all usual features (clock, fuel gauge etc.). I've only covered 100 miles on mixed roads, however, the bike coped with everything well. It's comfy and I had no scares. It's predictable and reassuring. Small physically (as is the bike), smooth, torquey and economical. It beats cars from traffic lights. None yet as the bike is new, but my daughter's has had no problems in 2 years. Seems well built and painted nicely. DIY usually and can get fully synth oil and filter for £30. If it needs plugs and air filter, brakes etc. the all-in cost is less than £150. Not used to having no screen at all (could have bought a faired version). I've ordered a taller screen but haven't fitted it yet. It should help on the motorway. I was disappointed with the trade-in price, but the new bike was discounted so I'm happy with the amount paid overall to get a new one. Is a little spongy but stops very quickly even at high speeds. Very good has some weird vibration in the mid range comes threw the handlebars and foot pegs occasionally. Cheap to service and most parts are cheap. Mines a 66 plate and works perfectly easy to do most yourself. Comes with abs. Standard clocks and a gear indicator.